The DIY wall painting and really everything in our baby's tropical rainforest nursery design was hand-painted by my husband and me. The painted grass and jungle foliage that you see in the pictures go all the way around the room. My husband took care of painting the background and the large graphics and I managed the task of painting the details. We chose the Fisher Price Rainforest collection as our son's crib bedding because I fell in love with it the minute I saw it before we even knew he was coming. It took a total of two weeks to complete our nursery decorating project because I have a full time job plus I was 8 1/2 months pregnant at the time. But it was worth every bit of effot that it took because now it is truly amazing to see how excited our son gets when he is held up to touch the jungle animals that his dad and I created. We used a projector (nothing expensive, a cheap kid's toy) to help us draw a whimsical and fun version of various animals that might be found in the rainforest. During this stage of creating our tropical rainforest nursery design we outlined the features of the jungle animals and the grass on the nursery wall. It was easy to paint the animals' features after the outlines of the images were on the wall almost like coloring pages in a book. And now we have just found out that our second baby is on the way! And while our gender neutral tropical rainforest nursery design is still stylish, I'm very excited to be able to give our baby boy's nursery a makeover. And even though our son is only nine months old his dad and I plan to let him decide what theme he wants. Wish us luck and keep checking back on Unique Baby Gear Ideas to see what theme he chooses this time around. 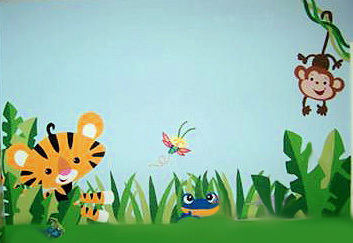 Courtney, thanks so much for sharing instructions for painting a mural on the nursery walls that has a baby tiger included. Did you find that acrylic paints dry too quickly while you were painting? If so, how did you deal with the paint getting tacky? Thanks for any help in advance. We had a son in late october I also hand painted his nursery wall but I like your room. The detail is amazing! I would love to see more pictures! any way to see pics of the rest of the room? Wow! I love this room! 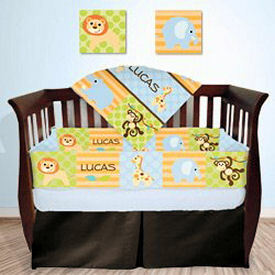 Ive always said when I have a baby, I want to do a rainforest theme! GREAT JOB! It's Perfect! Congrats!